No option to edit the dialed number and re dial it we have to type the whole number again. Its annoying. can i use android apps in wp8?? Anonymous, 05 Nov 2012Widgets on Android lag and eat battery way more than on WP with Live tiles.1 thing to confirm you all: android with ICS/JB/JB+ is no more battery hungry. And most importantly, currently all WP8 devices born with the crappiest battery life. SGS3 with 2100mAh battery lasts longer than ATIV S with 2300mAh battery. Lumia 820+920's battery performance is really v e r y bad. So its totally useless to praise wp8 for its battery performance. Okay????? Press the volume button and tap the "ring+vibrate" to change it to "vibrate"
Anonymous, 06 Nov 2012no swype, swifkey or other third party keyboard. one built in is crappy. or any third party ... moreThe built in keyboard is excellent! Dont comment an OS if you havent tried it for yourself! Mr_Ed, 12 Nov 2012I just picked up a lumia 820 on Saturday and overall i'm very happy with Windows. I was using ... moreNo, Windows Phone 8 is much faster than Android. Here, read this. 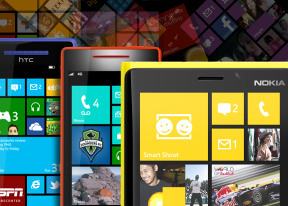 "Windows Phone 8, is the most ADVANCED phone OS technology in history. (It is technically the most advanced piece of software ever written, as it is just an ARM port of Windows NT with a different UI platform on top. It is the same core OS technology running massive server farms, and desktop PCs. Only the UI platform is changed, and technically the majority of the complete Windows desktop frameworks are still available. iOS is a recreated mobile version of XNU that has similar functions as OS X, it is a lot like the WinCE compared to WindowsNT. Windows Phones 8 is the full version of Windows NT, they could literally run the Windows RT desktop on it if Microsoft would allow it, but don't because of the complexity of the UI that doesn't work for novice users on a phone. OS X and Linux on the desktop are technically behind the WP8 OS technology. Which should both be a bit 'shocking' and a surprisingly cool to anyone especially if they dabble in OS engineering." I just picked up a lumia 820 on Saturday and overall i'm very happy with Windows. I was using an Android phone before and i've got an iphone with work and i find the speed that Windows works is quite impressive. I wondered if this was just because my old HTC DHD was still on an old version but my mrs upgraded to a Sony Xperia T and that still had quite a few delays opening app's in comparison. Time to connect to wifi after turning it on is also really good. Although it's not perfect. I've got a few issues which i'm hoping is down to me not using correctly so if anyone knows differently please let me know. 1, I cannot seem to have different sound levels for ring tone & media. When i change the sound level if watching YouTube it then changes my ring tone level which is quite annoying. 2, i cannot figure out a way of deleteing contacts in bulk, really annoying. 3, lots of little app's or widgets that i used with Android aren't available. For example i used to use a widged which would turn my phone on silent at the press of a button but i cannot find one for WP. I hope these are just me knowing what i'm doing so if anyone could tell me otherwise it would be greatly appreciated. jr, 06 Nov 2012Nice feature but not planning to shift to windows phone, its not yet mature fo them to fully m... moreExactly...I am a Linux user and have always supported open source. I make custom roms for the Sidekick 4G over at XDA and find the abundance of free software available at Google Play simply amazing. Sure, if you want the premium feature of an app you have to puchase the license key but still...no where near what Microsoft asks for. Wind, 29 Oct 2012I read the disadvantages section and I'm extremely disappointed. Still no Bluetooth file trans... moreI think you have not handled the phone yet. It is now supported with bluetooth transfer. too many comments but only opinions, is there someone out there have already used the WP8? jr, 06 Nov 2012Nice feature but not planning to shift to windows phone, its not yet mature fo them to fully m... more"Stability and speed is why Android wins over Windows"?! Are you kidding me? Did you intentionally swap the names of operating systems in that sentence?! Anonymous, 30 Oct 2012why to use "Galaxy Series Wallpapers" on a windows phone Lock... it killed the appea... moreBecause the screenshot is taken from Samsung ATIV S.
no swype, swifkey or other third party keyboard. one built in is crappy. or any third party customization. Nokia lumia 920 has the things noted as negatives. *Lock screen widgets is there in wp8 if i remember ms show on wp8. And a,lot more than the competition. TheAgent, 04 Nov 2012By "customization level" you mean changing a background picture for all the wasted s... moreWidgets on Android lag and eat battery way more than on WP with Live tiles.